Today you may have to made a decision that calls for you to detach from any personal investment and approach things objectively and impartially. 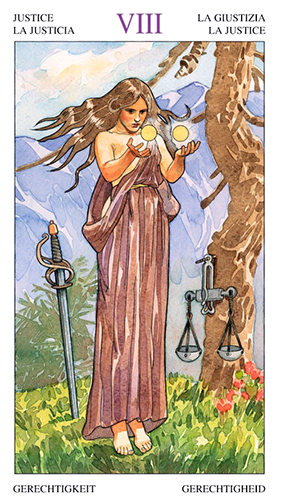 In this version of the card, a woman stands in a clearing with a pair of tiny orbs hovering inches above her grasp. She stares at them, transfixed, as though she’s channeling all of her energy into keeping them afloat. You can almost feel the electricity in the air — notice her hair standing slightly on end and the orbs glowing above her hands. If you look closely you’ll see that she also appears to be levitating — her feet barely touch the ground. A scale hangs from a tree on her left and a sword is driven into the ground on her right. These are common themes with the Justice card. They represent fairness, wisdom, reason and intellect. The Justice card refers to Universal justice — right vs. wrong rather than what you might desperately hope for or want to happen. The Justice card also encourages you to make adjustments in your own life in order to bring it back into balance. If you find yourself approaching a situation from a strictly emotional standpoint, you’re unlikely to see it objectively. And if you approach it from an overly rational standpoint, you could overlook the subtle nuances that make it unique. You may need to get some spiritual altitude; like the woman in the card you might have to “rise above” so that you can see things more clearly. But if you’re able to let go of your attachment to the outcome, the answers you seek will reveal themselves to you in this way. The card used for today’s tarotscope — Justice — is card is part of the Sorcerers Tarot by Antonella Castelli, who also designed the Tarot Art Nouveau and the Astrological Oracle cards. I am very confused, please help, I only read the horoscope and do not understand most of the time. Please someone could help me. I have no money to pay for the questions. Thank you. Hi Anna… the horoscopes can be very general as they’re based on Sun Signs only. An astrologer looks at all of the planets as well as angles, houses, rulerships, aspects and a variety of other things. 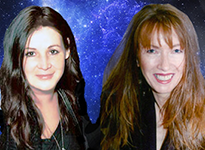 If you want to submit a question for either the Ask the Astrologers or Ask the Tarot column, you can email us privately with your birth info and questions. I can’t guarantee we would use it, but if it’s something that fits with what we’re doing with this site there’s a good chance. All the best.